Established in 1981, Quality Search has become one of the premier firms specializing in placing Packaging Professionals. Our dedicated team is ready to serve your needs. 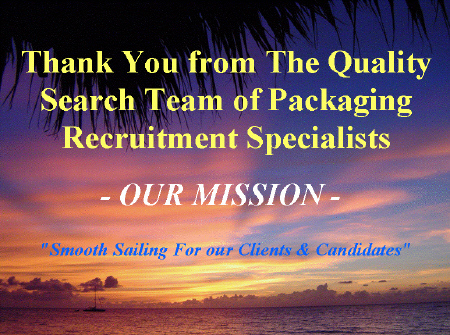 We are a Packaging Search Firm with Packaging Recruiters that specialize in recruiting Packaging Engineers and Professionals. We list available Packaging Positions and Packaging Professionals. We pride ourselves on providing applicants and clients with quality service and resources to meet their ever changing needs. Because of our unique Candidate perspective and Client perspective, we take time to listen and we work with, and for you, every step of the way to guarantee satisfaction and success! You might qualify to be showcased in our Web Site as a "Featured Candidate" or "Featured Company"! When it comes to your Packaging Career, we provide valuable and useful Resources for Candidates. Employing companies place trust in our experience as we provide valuable help and useful Resources for Companies. Furthermore we save the Client valuable time and energy and our expertise allows us to find the highly qualified Packaging Professional. "THE QUALITY SEARCH TEAM - Ready to Find the "Right" Position or Professional that Fits your Requirements!" "Our Goal is to Find the "Right" Position or Professional that Matches your Specific Requirements!"